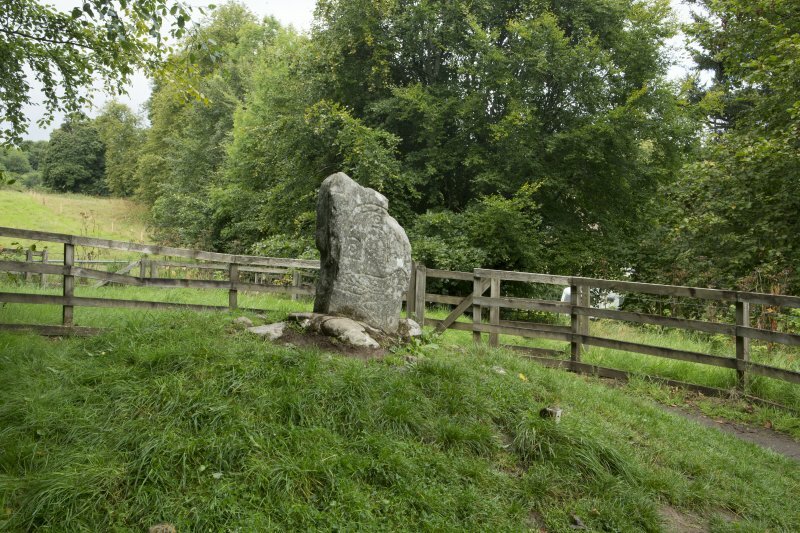 View of 'The Eaglestone', Clach an Tiompain Pictish symbol stone, Strathpeffer. 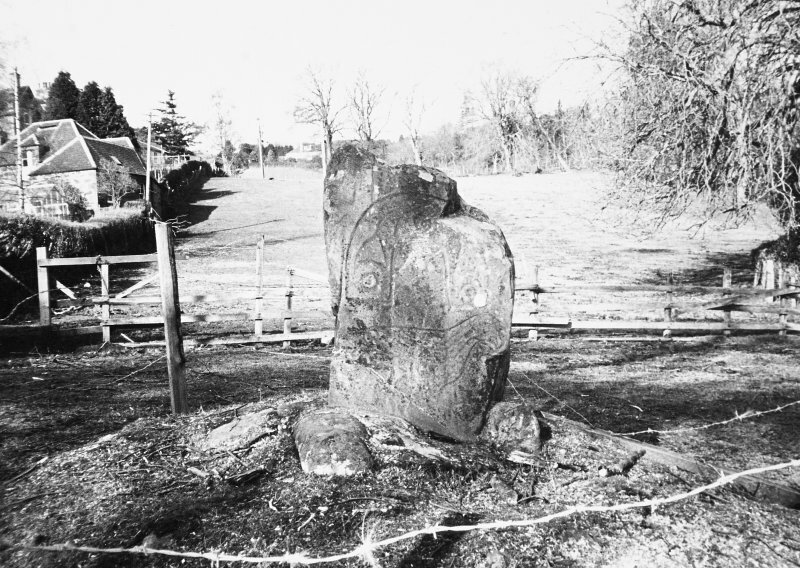 View of pictish symbol stone (with scale). 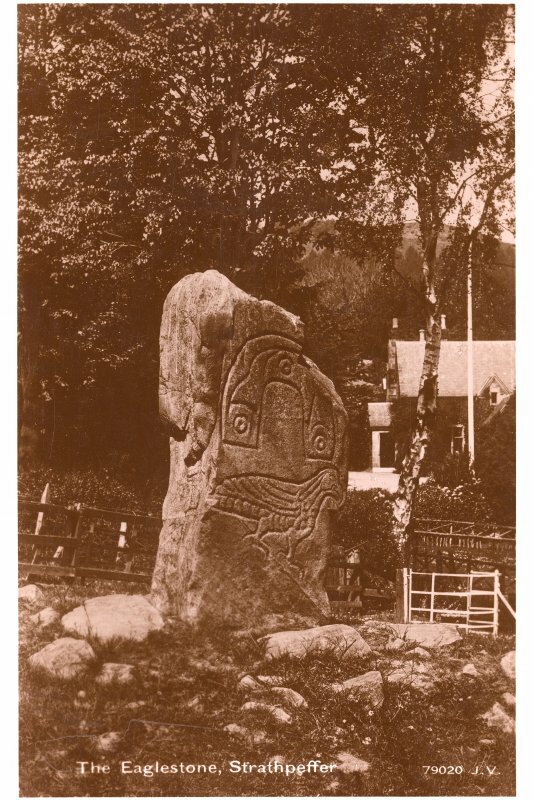 The Strathpeffer symbol stone. From J Stuart, The Sculptured Stones of Scotland, i, pl. 108. General view of symbol stone on top of mound from south east. 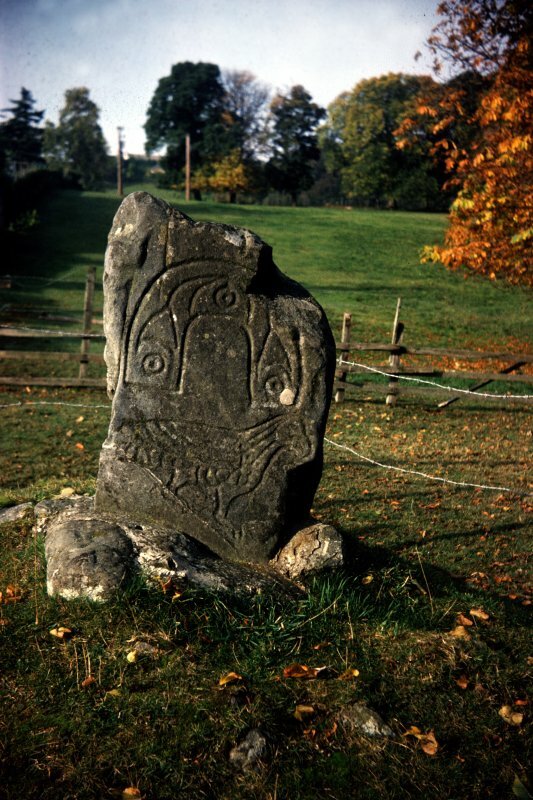 View of pictish symbol stone. 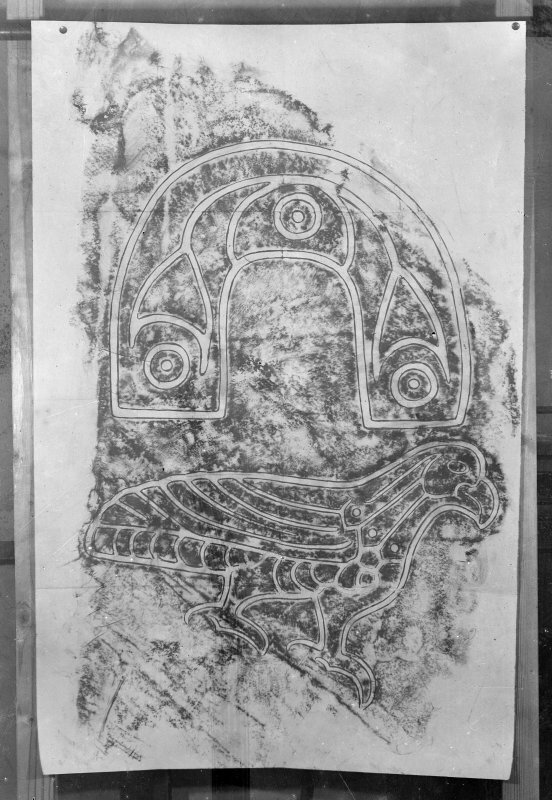 Photographic copy of rubbing showing detail of face of the Eagle Stone, Clachan Tiumpan, Strathpeffer. Present location: in situ in field. Evidence for discovery: first recorded in the mid nineteenth century. It stands on the edge of a terrace with a cairn of stones around it, but these may result from field clearance in the past. It was set in a concrete base in the twentieth century. Present condition: good except for damage at the top right-hand corner, caused probably by its use as a sounding stone. Two large symbols have been heavily incised on one face of this stone: an ornamented arch symbol above an eagle walking to the right. References: Stuart 1856, pl 108; ECMS pt 3, 61-2; Fraser 2008, no 129. Desk-based information compiled by A Ritchie 2017. 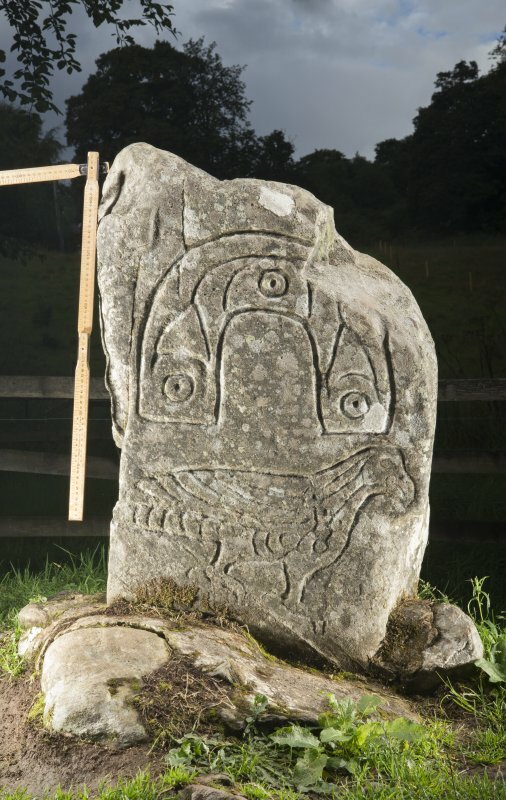 This symbol stone, which is called locally the 'Clachan Tiumpan' is a slab of contorted blue gneiss, roughly rectangular, but with the right hand top corner broken away, 2 ft 8 ins high by 2 ft wide and 10 ins thick, sculptured with incised lines on one face with the horse- shoe symbol, and under it the bird symbol. This stone stands on a small tumulus. Clach an Tiompain, a symbol stone as described. Visited by RCAHMS (JRS) March 1989. 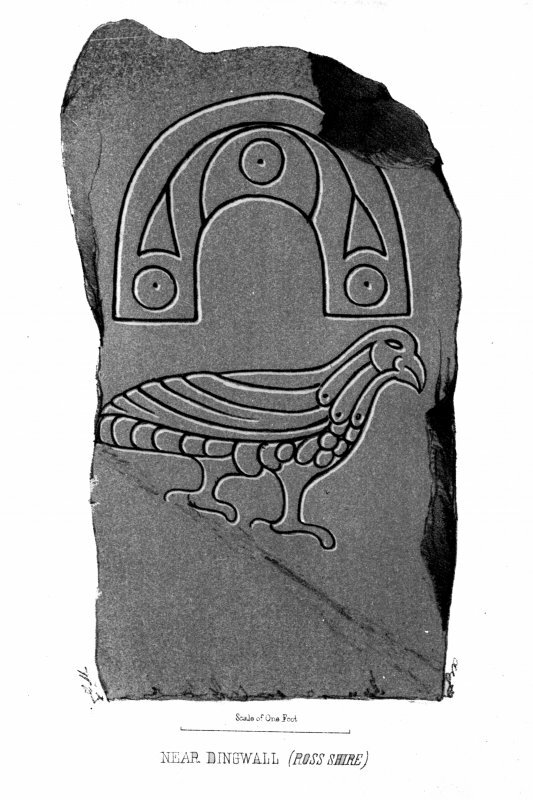 Class I symbol stone bearing on the south-east face a horseshoe above an eagle. A stout slab, somewhat damaged at the top, which has been re-erected in a concrete base in its original position. It bears two symbols: a 'horseshoe' decorated with a curvilinear pattern and below this a realistic eagle with long wing feathers, hooked beak and strong claws. 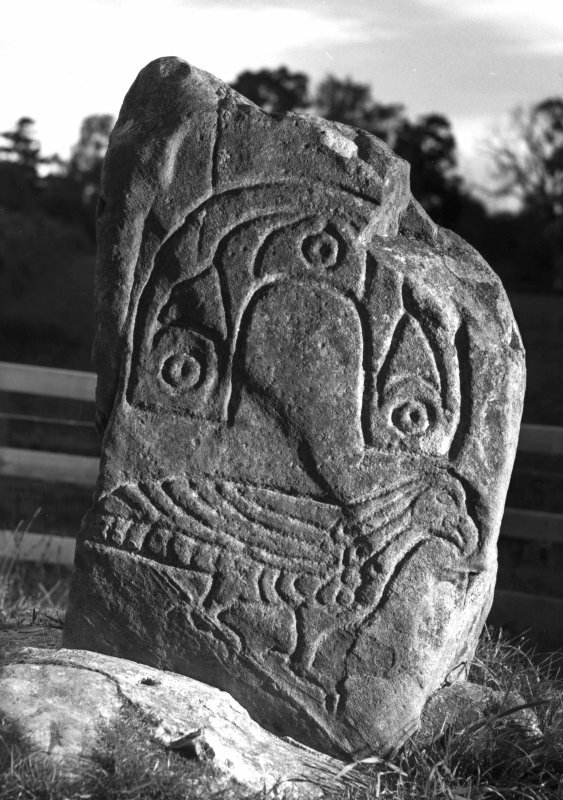 The stone is often called simply 'The Eagle Stone', but its Gaelic name was 'Clach Tiompan' or sounding stone. 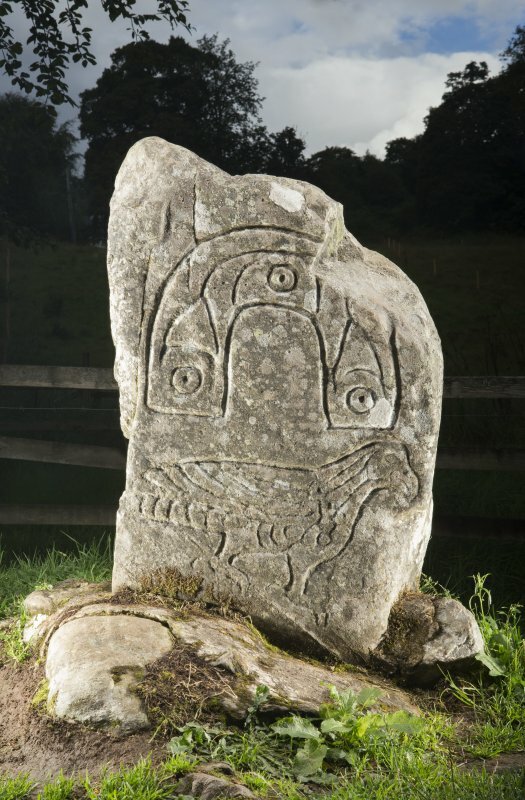 It is a good example of a Pictish symbol stone and the symbols are deeply incised and easy to see.